In case you hadn’t heard, Sony announced the PlayStation 4 at a live event yesterday. By now you’ll have eagerly lapped up all the information from the Sony PlayStation announcement. You’ll have seen our name in the list of confirmed developers. We’re delighted to finally be able to tell you that JAW are developing for the Sony PlayStation 4. We can’t talk about what we’re working on just yet. Just be assured it’ll be worth the wait. It’s entirely possible that the mystery project has nothing to do with Oddworld — the studio has hinted that they have some non-Oddworld plans in the works in the past — but with the amount of Oddworld titles already announced, it’s a safe bet we’ll be seeing Abe and friends on the next generation of consoles. Posted as a poll on official Oddworld Inhabitants blog, the question has a number of preset choices, including Abe’s Exoddus HD, The Brutal Ballad of Fangus Klott, a Stranger’s Wrath sequel, Squeek’s Oddysee, and Munch’s Exoddus. Some of these titles will no doubt be recognized as previously shelved Oddworld projects, while others (like a Stranger follow-up) are new ideas, at least officially. The team are quick to stress that the poll won’t be the only factor that decides their next project, but it’s still interesting to see a games developer asking exactly what people want to see. As of this writing there are just over one and a half thousand votes, with Abe’s Exoddus HD leading with over 400 votes. Earlier today game developer Just Add Water posted the first screenshot of the upcoming game Abe HD to their Twitter account. The screenshot, which you can see below, appears to feature an area which appeared very early in the original Abe’s Oddysee – the second “screen” that players visited in RuptureFarms, in fact. Just like in the original area there is a Directory (which were used as maps in the original game) and a ledge. Abe himself also appears in the screenshot. It appears that in this game Abe will be realistically rendered and colored, rather than having his skin tone simplified outside cutscenes (as happened in Oddysee and Exoddus). The first screenshot of Abe HD (click for full size). The second part reiterates some of the previously-discussed difficulties the JAW team has had with getting the game published on Microsoft’s Xbox 360 console, including the limitations of the Xbox Live Arcade platform and the requirements of Games on Demand. A teaser website for Oddworld: Hand of Odd has been put online. According to the page footer, the website was created by Just Add Water. A Whois search confirms that the domain name was registered by someone working at JAW. The page is currently light on content, featuring only the Hand of Odd logo and some copyright information. The official Oddworld Inhabitants Facebook page continues to be a great source of Oddworld content, with photographs of two different games running on the PlayStation Vita having been posted last week. The first photo shows a rather thrilling gameplay scene from Stranger’s Wrath. Unfortunately, the lack of detail prevents any in-depth analysis. The second image is a little more interesting, as it doubles as the first look at Munch’s Oddysee HD running in real time. 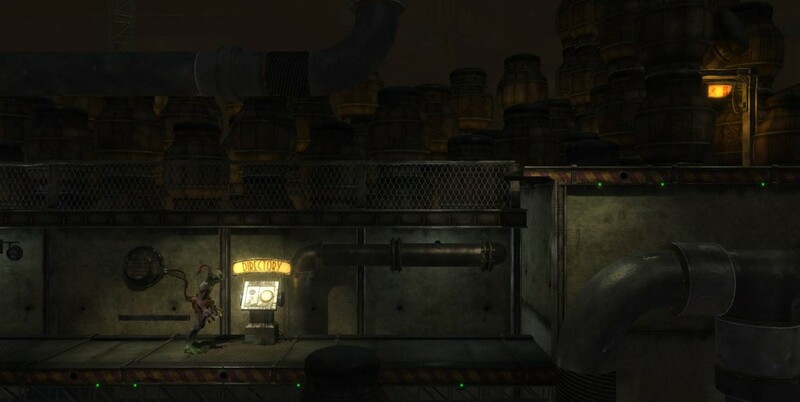 The improved textures and higher-detail Abe model can be seen despite the low image resolution, and changes have been made to in-game signs to display controller buttons for the PlayStation. The photographs were taken around the same time as the games were previewed on the Just Add Water office livestream. It appears that the team are making good progress on porting the games to the handheld platform.